Great news! 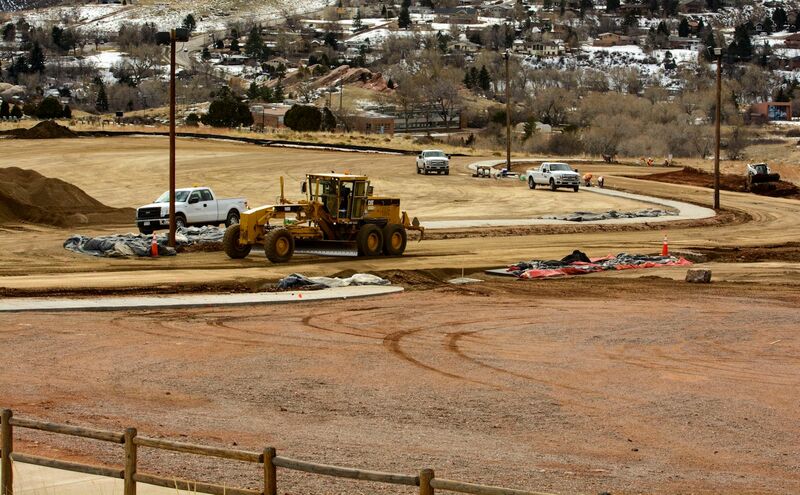 Expansion of Red Rocks Park! 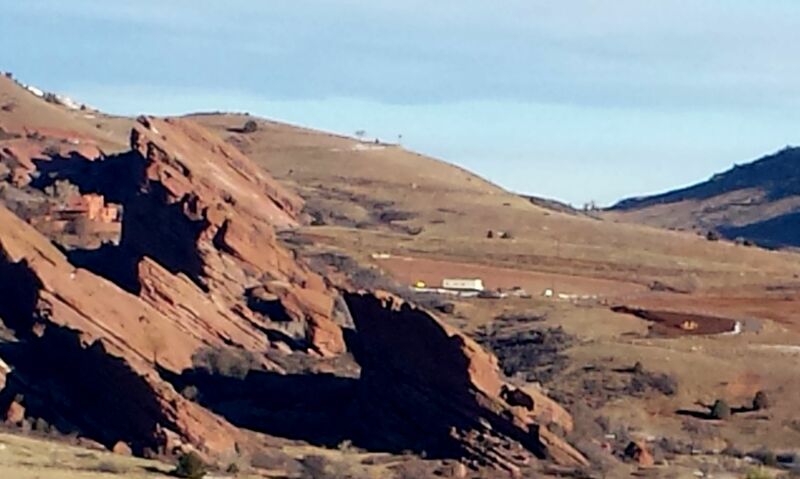 Mayor Hancock announced that property adjacent to Red Rocks Park would be officially designated parkland. [Read press release as pdf.] 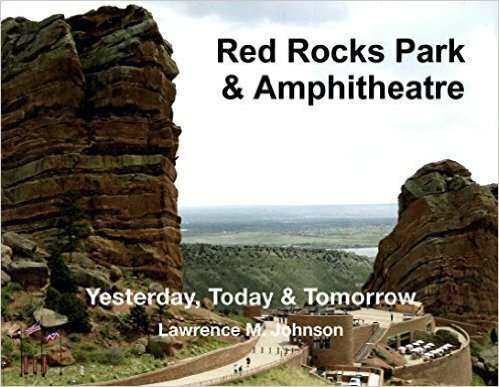 The announcement was made at the dedication of the Red Rocks National Historic Landmark Wednesday night, July 15, on the 75th anniversary of the original dedication of Red Rocks Amphitheatre. As Denver’s mayor from 1991-2003, it was my privilege to embrace Mayor Speer’s vision and carry it into the 21st century. Wherever we could my administration added to and expanded our city’s parkland as opportunities became available. Red Rocks offered one of those opportunities. 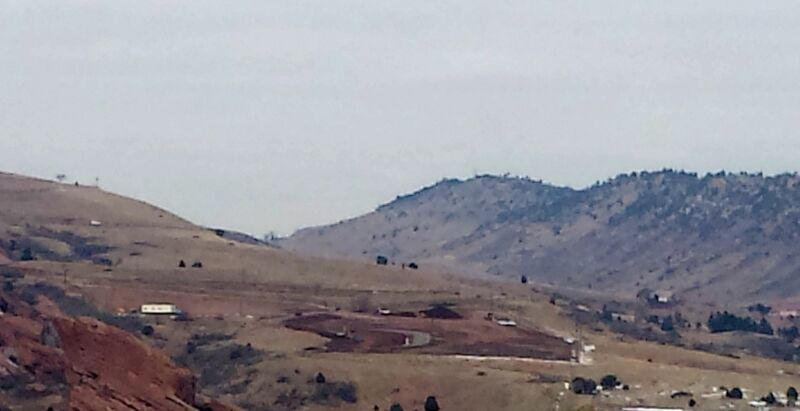 … The prospect of an increasing population in the valley would have potentially impacted amphitheatre operations. 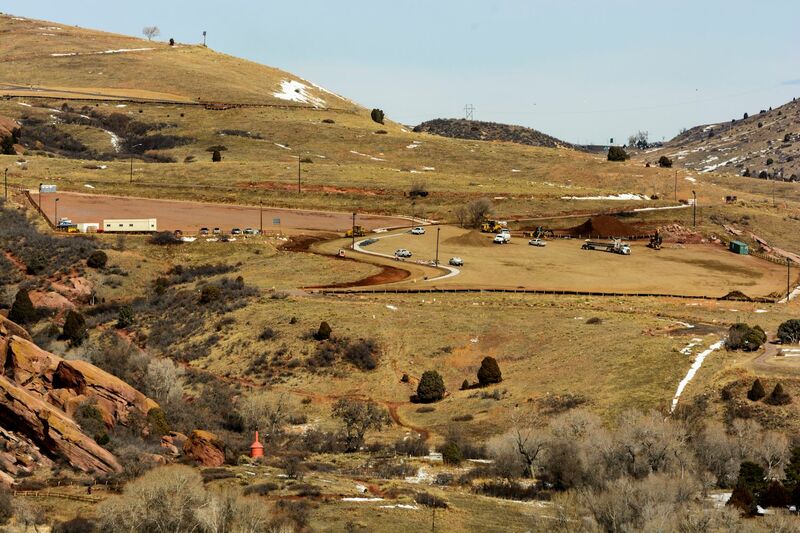 We saw a once in a lifetime chance to preserve open space near the park and seized an opportunity to acquire the 193 acres. At sunrise, the property to be designated lies in shadow in the foreground of the amphitheatre. SL White photo. 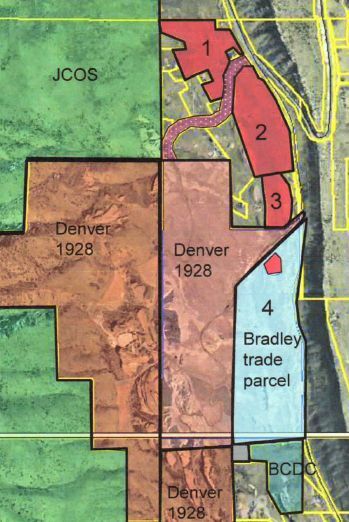 The property to be designated, known as the Bradley trade parcel, is 98 acres out of the 193 acres acquired in May 2000 and has significant natural values, including native vegetation, wildlife habitat, and rich geology and history, as well as its position as a scenic buffer for the park. The addition lies east of the current park boundary and south of Entrance 2. The remaining three properties, which are still undesignated, are north of Entrance 2, as shown in red. See complete map. 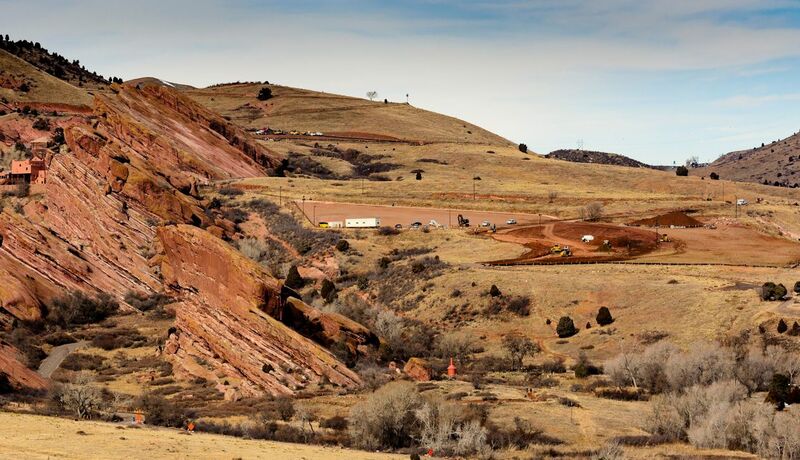 Denver Parks and Recreation is beginning trail planning for the area. We hope, in the face of increasing threats to the park from the expansion of Amphitheatre operations, development in this new area will be sensitive to preserving the natural values and character of the property. 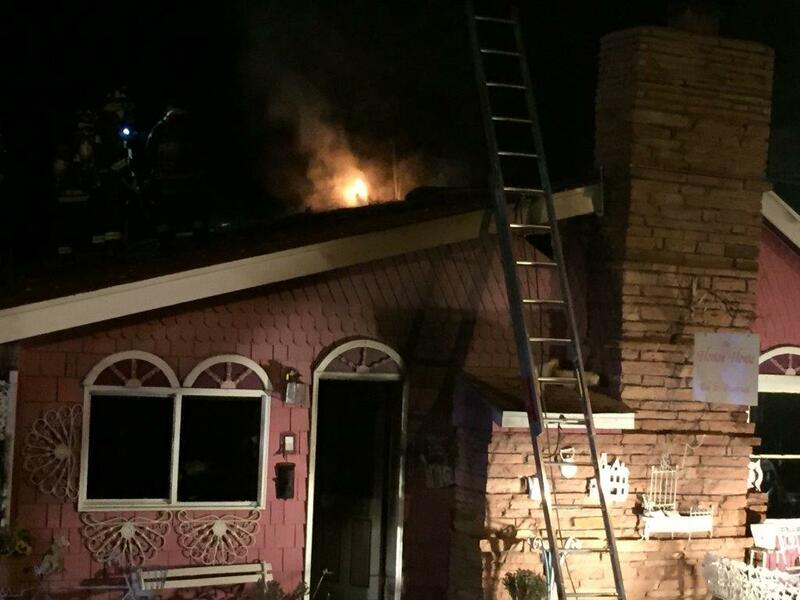 How does this new designation differ from National Register status? 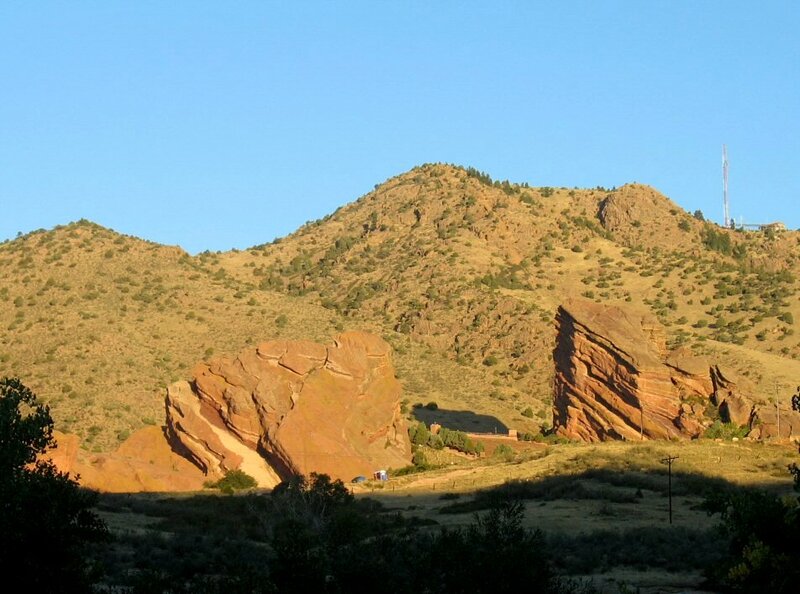 Red Rocks Park District was named to the National Register of Historic Places in 1990, along with several other Denver Mountain Parks. The National Register listing is a process for recognizing historic sites that are usually at least 50 years old, and are significant according to listing criteria, including things like their association with historic people, events, etc. Although nomination and listing on NRHP is a substantial process, nominations are handled by the state historic preservation office before involving the NPS in Washington. 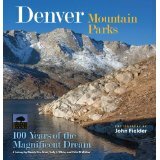 Colorado has more than 1400 sites, buildings, and districts listed on the National Register, but only 24 National Historic Landmarks (Civic Center included) and 14 National Natural Landmarks (Summit Lake Park is one). Historic Landmarks are automatically listed on the NRHP, but not all NRHP sites are, or are eligible to be, historic landmarks. NHLs have national significance, as opposed to just state or regional significance. The National Historic Landmark is a much more prestigious and exclusive designation and the nomination process is much more detailed. Although none of these designations confer protection on a property, the landmarks do involve some federal review to ensure the landmarked sites maintain the qualities that make them significant and worthy of this high honor. 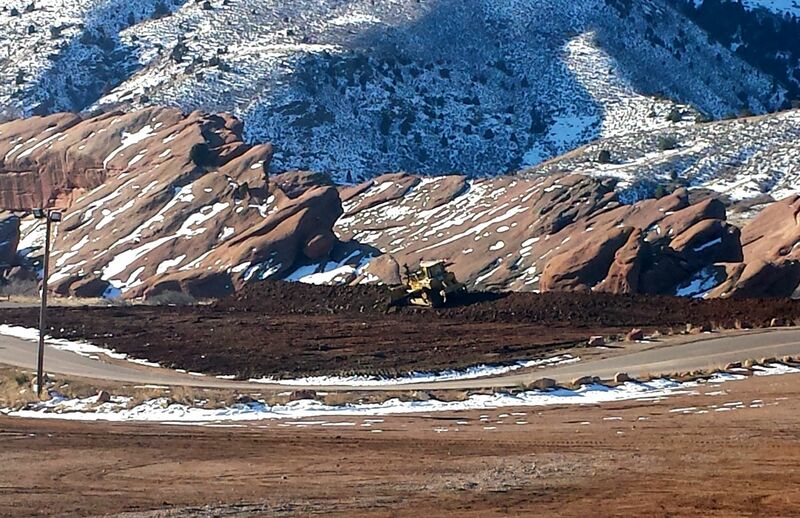 On January 27th, 2012, Red Rocks Park hosted the first winter concert in the Amphitheatre’s 75-plus year history. The sold-out event featured performances by Atmosphere and Common and was sponsored by the Icelantic ski company. Fortunately, the weather mostly cooperated, and no major snowstorms crashed the party. Read more at 9News, and at Huffington Post.